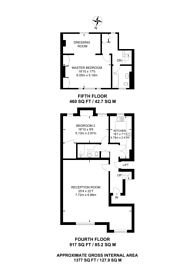 Offering an expanse of entertaining space, this expansive two bedroom luxury apartment is set on the top two floors (with direct lift access) and offers a spacious reception and a grand master suite with dressing room. Eaton Place is a sought-after Belgravia address offering easy access to the many shops and boutiques available around Northern Belgravia and Knightsbridge. A luxurious spot for upmarket afternoon tea and beautiful rooms for a romantic getaway. The perfect place to pick up a gift for the women in your life - classic handbags and luxurious accessories. In Duke of York Square Monday to Sunday, Startisans is a hub for start-up food stalls specialising in quirky, imaginative meals. 1,377 (127 Sq M) approx. We have over 1,000 property market reports for locations across London and Surrey - including SW1 and Belgravia.